Maximinus, his laureate, draped and cuirassed bust right. holding wand over globe and cornucopiae. Minted in Rome, late 236-237 A.D.
Mattingley, Sydenham, & Sutherland, "Roman Imperial Coinage", Volume 4, Part 2 (RIC), p142, nr. 20. Carson, R.A.G., "Coins of the Roman Empire in the British Museum", Volume 6 (BMC), p236, nr. 171. Sear, D.R., "Roman Coins and their Values" (RCV Millennium Edition), Vol. 3, p79, nr. 8315, var with obv. legend B.
Sear, D.R., "Roman Coins and their Values" (RCV 4th Revised Edition), p227, nr. 2345, var with obv. legend B.
Cohen, H, "Descriptions Historique des Monnaies frappees sous l'Empire Romain" (C), Volume 4, p513, nr 75. Seaby, H.A. 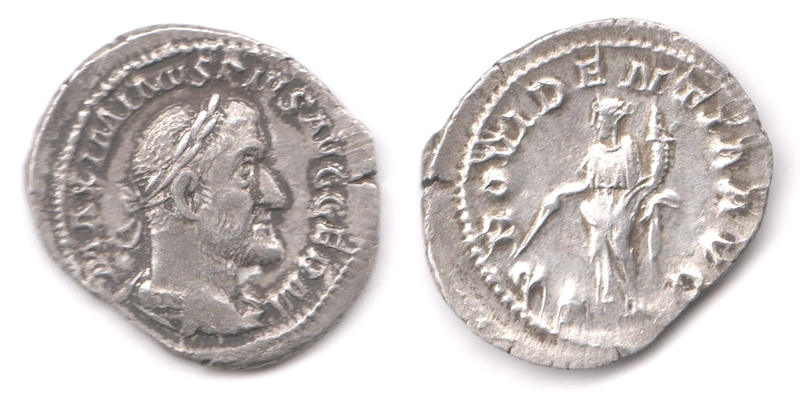 & Sear, D.R., "Roman Silver Coins" (RSC), Volume 3, p153, nr. 75. Van Meter, D., "Handbook of Roman Imperial Coins" (VM), p219, nr. 9. Kampmann, U., "Die Münzen der römischen Kaiserzeit", 2nd edition, (Kampmann) p269, nr. 65.9.